Leasehold law can be very complicated and will often require detailed legal advice, especially in the cases of charge disputes or buying a freehold. What is leasehold with a share of freehold? What are the key differences between leasehold and freehold? What does the type of tenure mean in practice for my property purchase? What does a leasehold property mean for my mortgage? 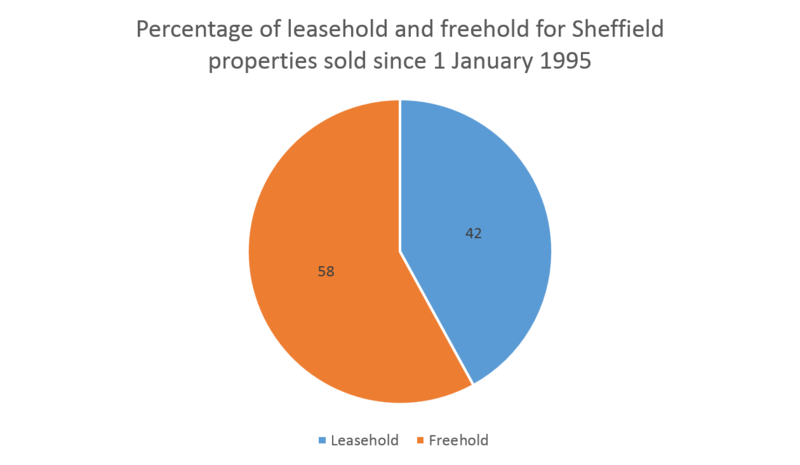 How many leasehold and freehold properties are there in Sheffield? What happens when the lease runs out on a leasehold property? A leasehold property is one where you own the right to live in the home for the time specified on the lease. However, you don’t own the land the property is built on, so you don’t own the property outright. Once the lease expires, the property will revert back to the freeholder, unless you extend the lease. You may pay ground rent and a service or maintenance charge to the freeholder. Most flats and maisonettes are leasehold, as a separate freeholder may own the building the flat is contained in, and the ground the property is built on. Many shared ownership properties are also leasehold. A freehold property is where the owner owns both the property and the land it is built on, in perpetuity. This is most common on houses rather than flats. Up to four leaseholders can buy the freehold from the freeholder as trustees, although this can complicate matters when one wants to sell their flat and share of the freehold. Leaseholders can form a company which buys the leasehold. They own shares in the company which means that they own a share of the freehold, although the flat owners and the company are separate legal entities. Leasehold You own the property for the term specified on the lease – which could be anything from a few years to 999! You don’t own the land the property is built on: you lease the property from the freeholder, who owns the land and to whom ownership will revert when the lease expires. To the freeholder or managing agent/landlord: ground rent, service or maintenance charge for common areas or building upkeep, a share of the buildings insurance. It depends whether it is a flat or a house. If a flat, you usually can’t make structural alterations unless the freeholder oversees them. On a house you usually need freeholder consent for structural alterations but not for non-structural. Leases for houses are sometimes more relaxed as the alterations don’t affect any other leaseholders, like other flat owners. Again, this may differ depending on whether it is a flat or house, and on the terms specified in the lease agreement. For a flat: the managing agent or landlord will be responsible for the cost of maintaining the building (this is reclaimed through a service charge). For a house: terms will be specified in the lease agreement but usually they will fall to the leaseholder. Freehold You own outright both the property and the land it is built on, in perpetuity. There is no lease to expire. Nothing to a landlord but in the case of a flat, you (or your chosen managing agent) are often responsible for the costs of maintaining both the property and the land. You may also be responsible for a share of the building’s insurance. None in respect of the leasehold, since you are the freeholder (unless there are any specific freehold covenants requiring consent from a third party). However you will still need building regulations approval and planning permissions to make major alterations to the property. For a flat, the freeholder or the managing agent/landlord. For a house, normally the leaseholder, unless otherwise specified in the lease contract. This is another method of owning the freehold of the building in which a flat/apartment/maisonette is situated. It was introduced to help flat owners combat the less favourable aspects of owning leasehold property, and brought into law by the Leasehold Reform Act of 2002. It happens when 100% of the flat owners work together to buy the freehold to their building, so that each flat owns its own freehold, and a commonholders association owns (and usually manages) the common areas of the building. It is still quite uncommon in England. Buying a freehold property is much less complex than buying a leasehold property – you could say that freehold is ‘lock, stock and barrel’ ownership, whereas there are many more terms attached to the purchase of a leasehold. However, the conveyancing process is largely the same, except for checking the terms of the lease. Most importantly, the length left on the lease could affect both the resale value of the property and whether a mortgage lender will lend against the length of time remaining on the lease. Once a property’s remaining lease drops below 80 years, it may be difficult to sell and have a lower resale value, mainly due to the cost of renewing or extending the lease. If you are buying a leasehold property and the lease remaining is very short, your mortgage lender might not lend you the money to buy it. Typically, most high street mortgage lenders prefer to lend on leasehold properties that have a remaining lease of more than 70-80 years. That’s because they usually need the lease to run for a further 30 years after the mortgage has ended, to ensure they can recoup their money on any repossession of the property. 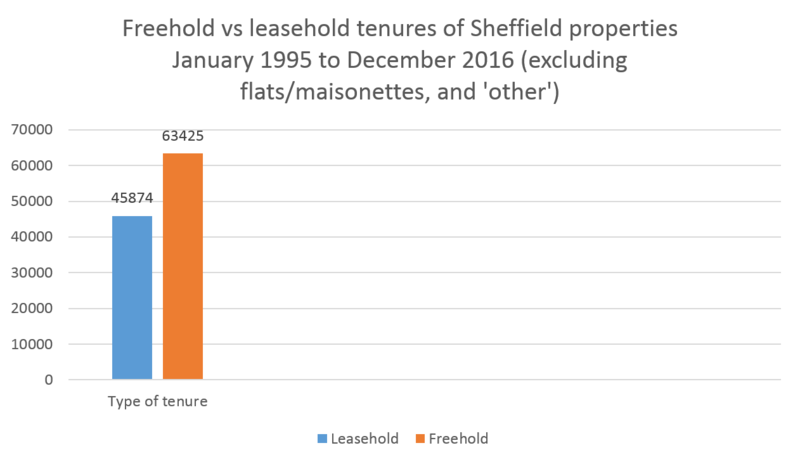 How many leasehold and freehold houses are there in Sheffield? *Property transactions recorded between 1 January 1995 and 15 December 2016 for detached, semi-detached and terraced properties, excluding flats/maisonettes and ‘other’, with the post-town of Sheffield. Total property transactions recorded: 109,304. Multiple property transactions excluded (where a property has been sold more than once in the period). There may be other properties not included in these figures because they may not have been sold in the period since 1 January 1995. However, you don’t necessarily have to move out when the lease ends, since the lease creates a tenancy which will continue until either you (as the tenant) or the landlord/freeholder decided to end it. The Leasehold Advisory Service has produced a factsheet on this here, as well as information on tenure security after the lease runs out. You may have to have the lease valued before you can extend or vary it, or buy the freehold. This can be very complex indeed and will require the input of a valuation surveyor. You can also buy the freehold or a share in the freehold, but you can ask the freeholder to sell you this at any time, and not just at the end of a lease. I want to buy the freehold of my house or a share of the freehold of my flat. This is called ‘enfranchisement’. You may or may not be eligible to buy the freehold: generally you must have owned it for at least two years, the original lease must have been more than 21 years, and the building must also qualify. You can pursue the formal route under the Leasehold Reform Housing & Urban Development Act 1993 (as amended) to compulsorily purchase the freehold with a number of other leaseholders, providing that the tenants, building and lease meet the relevant criteria. This Act dictates a certain order of actions and the timeframes by which they must be completed. You can find out more about the qualifying criteria on the Leasehold Advisory Service website with a factsheet here, advice on getting started, and valuing the freehold. Pursue the formal route for a compulsory purchase of the freehold, under the Leasehold Reform Act 1967. Again, this Act dictates a certain order of actions and the timeframes by which they must be completed – but these are different to the process and timeline for flats. The procedure is also governed by the Enfranchisement Regulations. Find out more about buying the freehold of a house, including the qualifying criteria, valuation and procedure, from the Leasehold Advisory Service here. The Leasehold Advisory Service has more advice on buying the freehold of both houses and flats. However, leasehold law is incredibly complex and will always require detailed and expert legal advice. Graysons conveyancers usually deal only with mutually agreed arrangements that are consented to by both parties, and not with compulsory purchases or lease extensions. I want to extend the lease on a leasehold property. Am I eligible to extend my lease? This is often possible, but you must have owned the property for two years (not necessarily lived in it), and the original lease must have been for 21 years or more. You can extend the lease for 90 years for a flat, or 50 years for a leasehold house. What does it cost to extend a lease? It’s worth noting that once a property’s lease has dipped to 80 years or below, it becomes much more expensive to extend the lease. This is the same for houses as it is for flats. At any rate, it can be anything from a few thousand pounds to tens of thousands to extend the lease. You can estimate the cost of extending the lease on the Lease Advisory Service’s calculator. How do I extend the lease? You can negotiate informally with the freeholder but this can be complex and long-winded. However, this is often the best route as any terms can be set, providing you both agree on them. We are experts in property, with many years’ experience in dealing with Sheffield’s many leasehold properties. Whether you are interesting in extending your lease, varying your lease, buying the freehold, or you’re a freeholder looking to sell the leasehold we can help. Simply call us on 0114 272 9184, email info@graysons.co.uk, or fill out our contact form and we’ll help you get started.